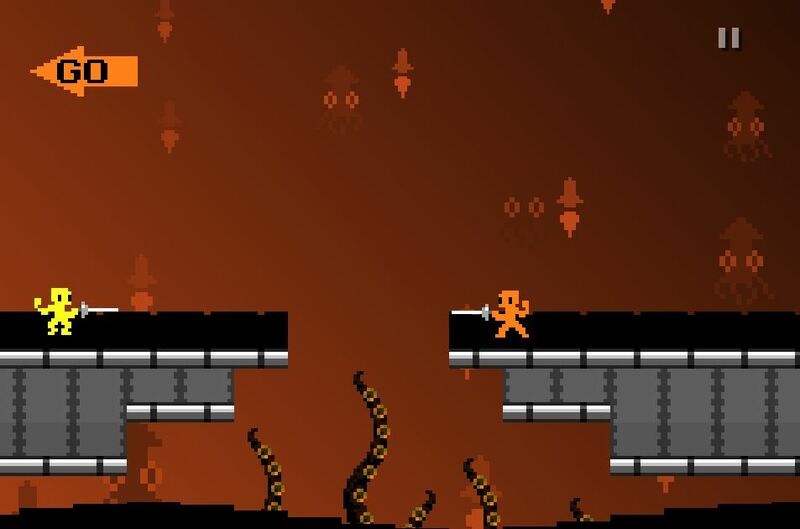 If you haven’t heard of NIDHOGG, I wouldn’t blame you. It’s an indie darling that has made its way from one convention to another over the years, and hasn’t ever been released as a full game to the public. I’ve never personally touched it, but the stories I’ve heard have always made me jealous of those that had. Today is finally the day when we’re all allowed the pleasure of touching it together…kind of. EGGNOGG is not NIDDHOGG, but it’s pretty damn close. The developers call the game a parody of NIDHOGG, but I think that does the game a disservice. EGGNOGG is the first way the public can enjoy one of the most delightful multiplayer experiences out there, and shouldn’t be missed by anyone who enjoys any kind of game, regardless of skill. The base mechanics of the game are simple. There are two characters onscreen. One must make it as far left as possible, the other must make it to the right. You have a sword that you can kill your opponent with, which allows you to run a small bit further in the direction you’re trying to go. The other player will spawn back in after a couple seconds of being dead, but those precious seconds are all you need to turn the game around. Each player can touch the other player with the sword to get a kill, and the swords can be moved up and down in order to block an incoming attack. Both players can block, thrust, slide, and jump to make their way around opponents and towards their respective finish line. Swords can also be thrown at an opponent, but this will leave you without a weapon. Each game lasts only a few minutes, but those minutes are some of the most chaotic, mayhem filled minutes of anything I’ve played. Swords are flying, people are sliding, and both players are trying to outmaneuver the other as quickly as possible. As soon as someone crosses their victory point, it’s time to start the game back up again. No amount of text can accurately describe the experience you’ll have playing the game, so I wholeheartedly recommend you download it for free right here. It’s free and can be played by two players on one keyboard, and also includes controller support. If there’s a local-multiplayer sized hole in your heart since Super Stickman Golf 2, EGGNOGG is the perfect size to fill it. 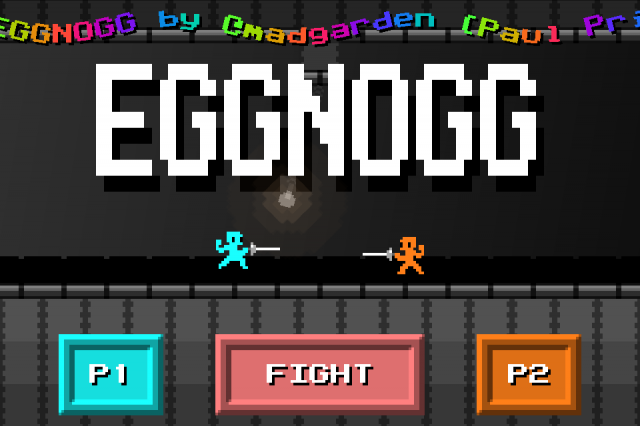 Tags: EGGNOGG, Free, Indie Games, Multiplayer, NIDHOGG, PC. Bookmark the permalink.